Happy Thanksgiving To All of Our Fans From The U.S.! Time To Gobble Up A Gobbler Once Again! Today is a day to spend with your family, playing together, eating a great holiday meal, and seeing distant family members that you rarely have the opportunity to see! We sincerely hope that you and your family have a wonderful Thanksgiving and are grateful that you've decided to spend even a moment of this special day reading this holiday wishes article! Re: Happy Thanksgiving To All of Our Fans From The U.S.! Happy Thanksgiving everyone! 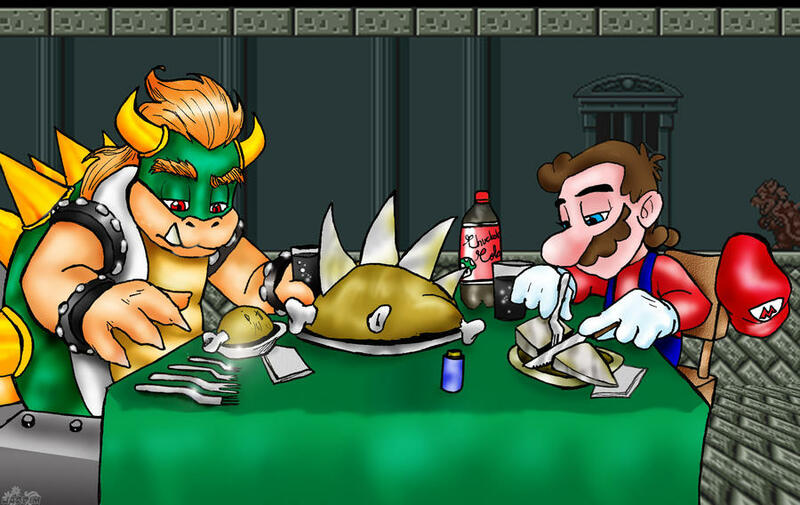 Is it just me or are Mario and Bowser EATING Sonic The Hedgehog instead of a Turkey for Thanksgiving dinner in the picture for this article?! Roasted Sonic for dinner!? Yes please! I hope everyone had a tasty Thanksgiving! @Ragnarok wrote: Happy Thanksgiving everyone! Is it just me or are Mario and Bowser EATING Sonic The Hedgehog instead of a Turkey for Thanksgiving dinner in the picture for this article?! I thought the same thing when I first saw that image! @FM_Alchemist wrote: Roasted Sonic for dinner!? Yes please! I hope you had a great Thanksgiving, everybody in the United States of the USA! Aussie Thanksgiving is on the 31st February...in other words, I've never experienced it because it doesn't exist yet.